A gift of any Alonzo King LINES Ballet performance is the opportunity to see the company’s stunning dance artists. Even if the individual choreographic works don’t necessarily speak to you, their technical bravura, exceptional eloquence and authentic grace are indisputable. 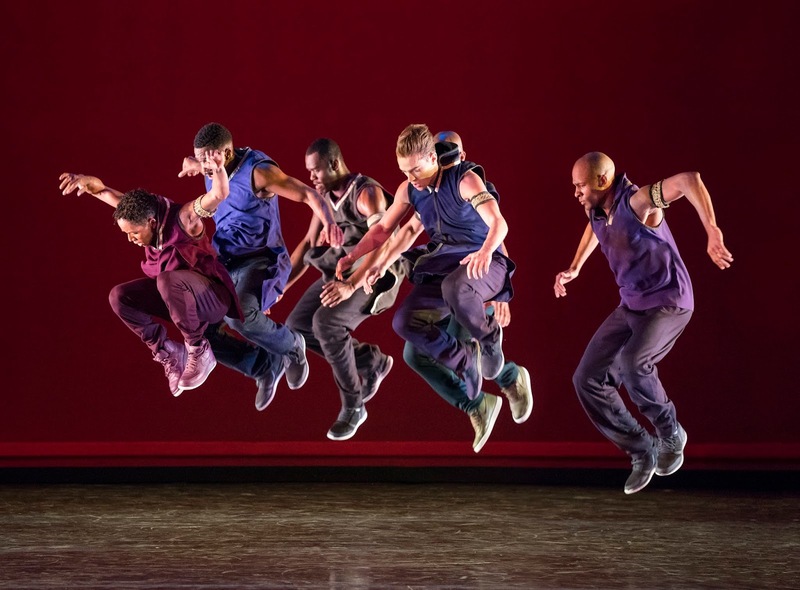 And the dancers were absolutely on fire Friday night as LINES opened its spring season at Yerba Buena Center for the Arts. I can’t stress enough the gift and privilege it was to witness them in motion. The program itself, a double bill featuring the return of 2016’s Art Songs and the world premiere of Pole Star, also impressed. Both pieces mine the dialogue and exchange between movement and music - a rich line of inquiry that was central to the troupe’s fall offering, which included a nod to Baroque musicality and a collaboration with Kronos Quartet. Six months later, LINES continued that foray into the sound/body connection. In music, counterpoint is a compositional tool, where motifs, lines or voices are experienced as simultaneously independent and interdependent - independent, in that they certainly can stand on their own, and interdependent, in that they also work together to create a sumptuous aural palette. In Art Songs, Artistic Director/Founder/Choreographer Alonzo King looks to that concurrency, and places movement as a counterpoint to Baroque, Romantic and contemporary composers. Costumed by Robert Rosenwasser in whites, silvers and black velvet, the company contributed an additional artistic line to the recorded instrumental and vocal selections, and in doing so, added a riveting tone of desperation and passion. While there were a few ensemble sequences, the majority of the work was expressed through six chapters of pas de deux (and one trio). And the drama was intense. Relevés were informed by frenetic urgency, as were surprising contractions in the head and upper back. Dancers rapidly slid across the floor and then stamped their feet to the ground, as if trying to extinguish a fire. 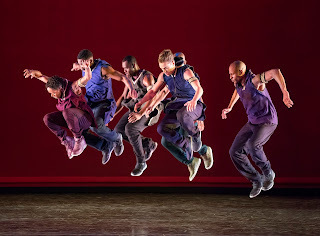 LINES’ sky-high extensions, super flexion and attitudes in second were abundant, though keeping with Art Songs’ intensity, dancers quickly crumbled after hitting one of those extreme postures. Recorded music can sometimes be tough in dance performance, but here, because the choreography was having an active contrapuntal conversation with J.S. Bach, Robert Schumann, George F. Handel, Henry Purcell and Lisa Lee, the atmosphere felt very alive. But if you were craving live music as a frame for dance, Pole Star, King’s collaboration with famed Vietnamese musician/composer Vân-Ánh Vanessa Võ, fit the bill - a forty-minute work of intersecting textures, layers and moods. From the orchestra pit, Võ’s hauntingly beautiful zither rose, occasionally interspersed with text and ambient sounds. Billowy smoke poured into the space. Projected on the back cyclorama was a film (by Jamie Lyons) of bright green rolling hills, their color matched by Rosenwasser’s wispy, flowy costumes. Adding to that lush environment was King’s evocative choreography. Pole Star didn’t read as narrative, but it wasn’t abstract either - charged emotions were unmistakable and potent imagery, ever present. 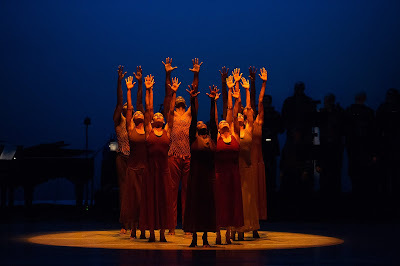 As in Art Songs, LINES’ signature choreographic positions were aplenty, though, here they were also infused with unexpected movement practices and traditions. Some sections were clearly inspired by military drills, others by martial arts. Twisted, serpentine torsos abounded, as did vignettes of falling and catching oneself. Grounded, percussive footwork unison spoke of a shared experience while aggressive phrases conjured confrontation. Such a broad collage of tones and qualities! But for me, what was most impactful in Pole Star was the juxtaposition of the body and the projection. Seeing the company against the mountains (and later blades of grass) brought an interesting question of corporeality to the table. The sense of place had become transitory and fluid. At moments, it felt as though the dancers had actually been transported to those natural settings and were dancing amidst them. LINES spring program definitely tackled movement and music from two distinct vantage points – Art Songs and Pole Star were very different from each other. No question. But having said that, within the body of each piece, there was a strong sense of sameness. From the first light cue to the final blackout of both dances, their energy, quality and dynamics were very similar. Too similar for this viewer. And a side effect of remaining at one energetic level is that the work ends up seeming long. Neither Art Songs nor Pole Star actually were too long, but unfortunately, they felt that way. In danceland, many musical scores end up being inexorably linked to particular choreography. When I hear the first notes of Tchaikovsky’s Serenade for Strings in C, I anticipate the corps de ballet dressed in light blue for George Balanchine’s Serenade. The whistles and unexpected intervals at the beginning of West Side Story make me crave Jerome Robbins’ signature relevé in second. But I also love it when dancemakers break with convention and posit new, different, unexpected language with such scores. That’s what Justin Peck did with Rodeo: Four Dance Episodes, the opener on San Francisco Ballet’s sixth program, Space Between. The 2015 work takes Aaron Copland’s stirring music, originally composed for Agnes de Mille’s 1942 Rodeo ballet, and asks what it has to say some eight decades later. And the answer is, a lot. While Rodeo: Four Dance Episodes certainly pays homage to the past with nostalgic western tropes and old-school musical theater motifs, its choreographic syntax is undeniably twenty-first century. Pedestrian motions are seamlessly combined with highly technical phrases, making the work approachable and fresh. In one instant, the ensemble runs full speed across the stage; in another, they execute perfectly timed unison pirouettes. Peck isn’t afraid of stillness and uses it well throughout the ballet. Impactful, frozen postures of waiting and searching abound: palms splayed, long lunges and expectant upward glances. And the sense of camaraderie amongst the cast of fifteen men and one woman is palpable – they looked like they were having so much fun. 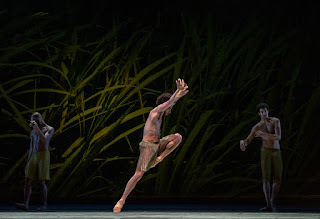 But it is the sole female role, danced by Sofiane Sylve, that is most intriguing. From the moment Sylve appears through her pas de deux with Carlo Di Lanno to the final blackout, one is struck by incredible self-assurance. She enters partway through Rodeo: Four Dance Episodes, and so, is indeed joining an ongoing, in process conversation that the men have been having. But with every step, every glance, it is clear that she feels no need to adjust her reality or fit into some perceived mold. Not only is this embodied in her solo work, but also in the primary duet. Peck imbued this pas de deux with abundant counterbalances – shapes and positions requiring equal force from both dancers - and at several points, it was Sylve who was providing the base of support for the partnering. And no discussion of Rodeo: Four Dance Episodes is complete without some bravura highlights. Hansuke Yamamoto wowed with his series of brisés cabrioles, and Esteban Hernandez’ purposely slowing fouettés were met with uproarious applause. 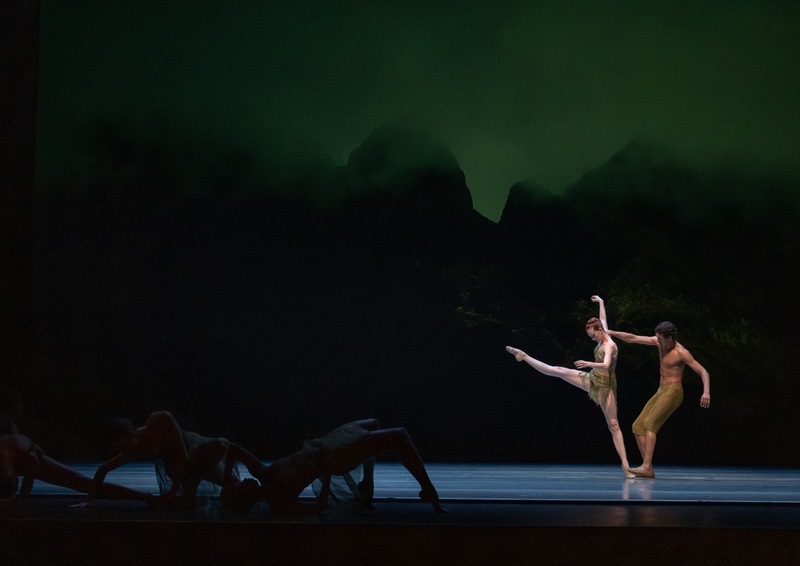 As the lights slowly warmed on Liam Scarlett’s new work for SFB, Die Toteninsel, it was clear that Program 6 was nowhere near done exploring the relationship between movement and music. Die Toteninsel impresses on many levels. Narratively, it has a real Rite of Spring vibe to it, minus the sacrifice part. There’s a community; there’s a feeling of ritualistic purpose; and there’s a definite ominous undercurrent. But the ballet’s shining glory is in its mirroring of Sergei Rachmaninoff’s music. Both have an air of unpredictability and morph from one space to another in a deliciously porous wave. Rachmaninoff’s compositions are known for having a wonderful quality of surprise and change, really transcending genre. In a single piece, you might hear the virtuosity and rubato of the Romantic era, the tonal ambiguity of the Impressionists, Baroque counterpoint and 20th Century chromaticism. And the genius is that it all works together. The same is true of what Scarlett created with Die Toteninsel. Defying a particular sense of time, the piece looked futuristic, biblical and mythological all at the same time. Its tone was concurrently determined, worshipful, passionate and foreboding. Partnerships were constantly in flux as the cast navigated their relationship to David Finn’s large circular light sculpture (which itself also shifted and pivoted throughout the work). Choreographically, Scarlett mined a range of styles and dynamics - pedestrian walking, classical arabesques, contemporary inverted lifts and serpentine twisting. And while there were plenty of large poses and vast extensions, Scarlett spent ample time with low positions. Low arabesques, low passés and turns in ¼ relevé felt a metaphor for being on a journey. A journey that, like those positions, hadn’t reached its final leg yet. A journey through a tunnel of moods, tones and atmospheres, that, even if you weren’t quite sure what was happening, you wanted to watch. Space Between closed with one more chapter celebrating the choreography/sound connection: the return of Arthur Pita’s Björk Ballet, which debuted last year as part of SFB’s Unbound Festival. 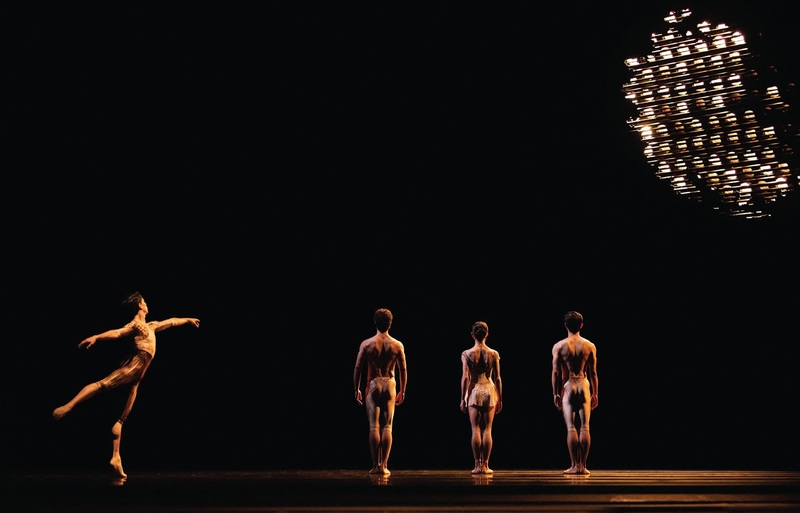 A tribute to the musical artist, Björk Ballet takes a very typical compositional form - the dance suite, a larger work comprised of multiple consecutive choreographic chapters, each one usually accompanied by a different musical selection. Pita followed the formula, with nine episodes set to nine songs. But other than that framework, there was nothing typical about Björk Ballet. There were characters, costumes and masks aplenty. We met fire soldiers, a sparkling butterfly, an army of chess pieces, a warrior Queen and a masked fisherman. Visual spectacle was everywhere: mirrored Marley floor, ardent make out sessions, fiber-optic palm trees falling from the ceiling, dancers standing atop a bright red platform, a giant fishing pole. Pita pulled from many movement genres including jazz, figure skating, yoga and acrobatics; I half expected aerial artists to make an appearance at some point. The piece was definitely entertaining. It moved quickly, was visually engaging and thoroughly inventive. Having said that, there were a number of sections that looked bizarre simply for the sake of being bizarre, which doesn’t speak to this particular viewer. And there was a missed opportunity near the end. One of Björk Ballet’s later chapters sees the large cast funneling on and off the stage in a jumping, pulsing staccato flurry. It felt like the conclusion, and because it did, the scenes that followed were a bit of let down.